For the third consecutive year the Olathe North will enter the season as at the top team in my power rankings. What will make the Eagles so special in 2011? Well, as usual the Eagle’s cupboard is stocked with athletes. The school had two big-time players transfer in during the offseason. Orange Mooney comes to the program from Phoenix, Arizona, where last season he was an All-Region performer at St. Mary’s High School. His addition immediately upgraded the Eagles’ overall speed (as if they weren’t fast enough already) and added yet another skill position threat. Then, as if one big name running back transfer wasn’t enough, Treshawn Root transferred across the district from Olathe East. Root was projected by many to be Olathe East’s starting tailback this season, but his transfer to Olathe North will make him an Eagle for his senior season. In addition to those two, Olathe North should see big contributions from senior defensive end Tanner Gentry (above) who was second in the Sunflower League in sacks as a junior. Gentry can also stretch a defense with his receiving skills on offense. Terence Brown will be another Eagle who should contribute heavily on both sides of the ball, from the linebacker and running back positions. The Eagles have gone 32-5 over the past three seasons, and their high rate of success should continue in 2011. Olathe East always finds a way to be good. In fact, the last time the Hawks didn’t have a winning record was in 1999. Their string of 11-consecutive winning seasons is four more than the next longest string (SM West has seven in a row), so putting Olathe East anywhere but near the top of the list would just be unpractical. The Hawks most notable returning players are Junior Williams, Matt Baltimore, and Ethan Goss—the latter two were First Team All-Sunflower League selections as juniors. Williams is the younger brother of Olathe East greats, Derahn (’09) and Dorain (’07) Williams, and he has as much ability as both. Last season he intercepted four passes and he’s one of the top returning defensive backs in the league. Baltimore is a pass-rushing nightmare and Goss will be the focal point in Olathe East’s offensive line. Olathe East’s hardest task will be replacing running backs Brandon Willingham and Austin Fulson who combined to rush for over 2,600 yards and 36 touchdowns last season. But don’t forget, head coach Jeff Meyers found Dee Bell to replace Andre Jones, JaVon Williams to replace Bell, and Willingham and Fulson to replace Williams. Olathe East reloads as well as any team, and I’m sure we’ll see another big time running back emerge in 2011. SM East’s Elliot Faerber will have the eyes of his school and the league on him in 2011 as he works to lead his Lancers back to another playoff berth. Faerber topped the league in receiving yards with 650 as a junior, and that helped in him in earning his offer and eventual commitment to Illinois. With his recruitment complete Faerber can focus all of his attention on the upcoming season. Running back Adam Lowe had spurts of dominance in 2010 and he’ll need to get close to or surpass the 1,000-yard rushing mark so that the Lancers can keep a good pass to run balance going. John Schrock was the cog that kept SM East in check last season, and now that he’s headed to Colorado to play ball someone is going to have to fill his shoes at the quarterback position. With Faerber to throw to, and Lowe to hand it off to, whoever is named the new quarterback will be stepping into a pretty good situation. Head coach Chip Sherman has done a tremendous job in his two seasons at SM East and the Lancers will be a fun team to watch in 2011. The Vikings are one of the few teams in the league who have the luxury of returning their starting quarterback, Armani Williams (right), and starting running back, Tre Burt. Those two were highly instrumental in the team’s 7-3 record last year, and you can’t put a price on experience especially at those two skill positions. However, if SM West is going to win some playoff games this season both those players are going to have to step their games up. Last season Williams had moments where he played like an all-league performer (his two touchdown 182-yard passing performance against Lawrence comes to mind) but as a whole it was his inconsistencies and crucial interceptions that really hurt SM West in two of their three losses. We should see significant strides from the senior signal caller in year two. Burt will get his fair share of carries as the team’s top running back and he could have a shot at breaking the 1,500 yard rushing mark if he stays healthy. Beyond that the team will be featuring a heap of new talent. Last year SM West went undefeated at all levels below varsity, and while that’s hardly a foolproof method for projecting success it does mean the Vikings have a strong crop up and coming, many of whom will earn their stripes this season. Ranking Lawrence fifth is based hugely on the assumption that junior quarterback Brad Strauss has developed into the league’s premier passing quarterback during the offseason (he wasn’t too far off in 2010). Strauss passed for an impressive 1,141 yards and 10 touchdowns in nine games last season. His 5:2 touchdown to interception ratio was outstanding, especially for a sophomore. Strauss’ primary target will be big play wide receiver Anthony Buffalomeat, who earned Second Team All-Sunflower League honors as a junior. Buffalomeat is a tall and wiry receiver who would have made an even bigger impact for Lawrence last season had he not suffered an injury midway through the year. Out of the backfield, senior running back Charles Jackson will be a nice compliment to Strauss and the aerial attack. On paper Lawrence has the makings of a much improved unit in 2011. Their one win in 2009 was an all-time low for the program, but they improved their win total to three games last season including a huge upset of Olathe East, and now the program could be on track for their first winning season since 2006. Losing running backs Nick Sands, Kendal Harland and Jake Crist to graduation was a significant blow to the Falcon football program, but fortunately they have the quarterback who orchestrated everything, junior Frankie Seurer, back again at the helm. Seurer only threw for 424 yards and four touchdowns, but he averaged 19.4 yards per completion and Olathe South’s run heavy offense negated the need for much passing. Seurer’s most valuable contributions in 2011 will be managing the Falcon’s offense and cashing in a big play every once in awhile. He had an impressive season in his first year starting as a sophomore and he’ll be a big time player for Olathe South again this season. He’ll lead the offensive skill positions, with the coach’s son, Scott Gourley leading the offensive line from his center position. On the defensive side of the ball the Falcons’ three most notable returning performers are defensive tackle Jared Douglas, cornerback Taylor Sheffield and safety Dylan DeVries, all of whom were honorable mention performers last season. Olathe South will have a lot of rushing yardage to make up for but they have a solid core of returning players on both sides of the ball and the transition to 2011 shouldn’t be too difficult. For the second year in a row Bob Lisher and company will be ushering in a new starting quarterback following the graduation of Dylan Perry. The quarterback position is a huge deal for all schools, but especially at Free State where quarterback reads are the centerpiece of the offense. 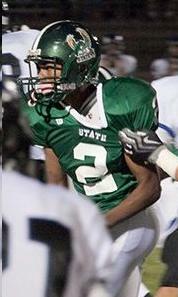 Free State’s top returning talent comes at the wide receiver position. Desmond Wyatt was a Second Team All-Sunflower League selection as a junior after catching five touchdown passes and recording just under 400 yards receiving. He returns alongside fellow receiver Shawn Knighton (right), who was also a consistent threat for the Firebirds last season. One area Free State won’t need to spend much time focusing on is the punt game. Punter Kale Joyce is rated by several scouting services as top ten punter nationally, and he’s drawing interest from some of the nation’s top college football programs. Free State doesn’t have a loaded roster returning the way they have in past years, but they didn’t have that luxury last season and they still managed to go 5-5. The Firebirds are going to have to find replacements at the quarterback and running back positions, not to mention patching up holes on their offensive and defensive lines. Early on it could be rough-going, but Free State has shown time and again that they are one of the league’s best when it comes to improving as the season goes along. SM Northwest, like many of the teams on the lower half of the list, was hit hard by graduation. The Cougars lost all-everything defensive end and tight end Drew Goodger, in addition to quarterback Stephen Mangelsdorf and running back James Gregory, among others. The Cougar’s only returning starters who earned Sunflower League honors last season are seniors-to-be Caulin Pendleton and Will Smith, both of whom were honorable mention performers. Pendleton will be expected to step up and lead the Cougar’s defense, while Smith is, on paper, the team’s top returning lineman. Head coach Aaron Barnett has had some pretty impressive seasons since taking over in 2006, but 2011 will be the biggest challenge he has faced thus far. The Cougars returning depth is paper thin and a whole new batch of players will be expected to step up and lead the team. Olathe Northwest has hovered just below the .500 mark since their inception in 2004, and early on in 2011 there’s nothing pointing to a major change in that trend. The Ravens top returning player will be running back Connor Middleton. Middleton received honorable mention all-league honors last season and he won the Class 6A state wrestling state championship in the 152-pound weight division. Middleton has good speed and burst, but so did Nick Bandy last season and it didn’t make a huge difference. Until Olathe Northwest starts beating the other Olathe schools they will continue to be viewed as the “little brother” in the Olathe School District. On paper they don’t have a bevy of returning talent, but neither does any other team in the league (with the exception of Olathe North). Olathe Northwest has little to no pressure heading into 2011 and it would be the perfect time for the program to sneak up on the other Olathe schools. Up until about a month ago SM South had little going for them, but the naming of Ryan Lonergan as the new head coach has given the program and its fans a renewed sense of optimism for 2011—it’s just that Lonergan and his staff will have very little time to shore things up before the start of the season. The Raiders’ top returning players are quarterback Alex Forslund and wide receiver Shawn Laurent. Both players received honorable mention all-league honors as juniors, and Forslund has a great arm and skill set when used properly. Also watch out for junior running back Gabe Guild, who was also an honorable mention performer in 2010. He’ll be getting a good deal of carries in Lonergan’s offense. The adjustment to Lonergan’s system—both offensively and defensively—could take some time for the Raiders to get used to. On top of that SM South hasn’t been a strong program in years and so it’ll be as much of a culture change as anything, but the Raiders have the right coach in place for future success. The Indians benefited from an easy district last year (SM Northwest, Wyandotte and Leavenworth) and they’ll contend with the same four teams again in 2011 for a shot at the playoffs. Realistically it will probably come down to their week nine game against Leavenworth to see if they make the playoffs again. SM North will be led by cornerback Mason Perez, who earned second team all-league honors and hauled in six interceptions last season. Perez will also be a big contributor on the offense side of the ball and he gives the Indians a decent scoring threat when he has the ball in his hands. Also returning is running back/linebacker Brock Burrows (right) who was an honorable mention performer as a junior. In 2004 Kansas coaching legend Tom Young came to Leavenworth and led the team to a 4-5 record. That was the last time the Pioneer football program fielded anything resembling a competitive football team. In the six seasons since then Leavenworth has gone a hideous 4-50 under four different head coaches, the latest being Kevin Kopecky. Kopecky and company went 1-8 last season with their one win coming against the Wyandotte Bulldogs in district play. Kopecky had his fair share of success at St. Thomas Aquinas but winning at Leavenworth is another animal. The school has the talent (see the men’s basketball program) but we’ve yet to see a coach do much with the program. Could year two under Kopecky be the season Leavenworth regains some inkling of respectability in the Sunflower League? We’ll find out in the first few weeks of the season. SMS above SMN and Leavenworth? I have a gut feeling that Leavenworth is going to have a breakout year. Lawrence sounds like they could definitely make some noise this year as well. The only solid teams I can predict are ON and SME. 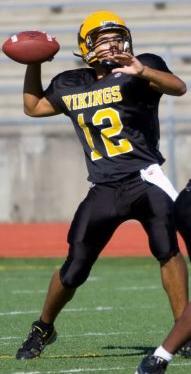 SME is getting a QB with a big arm and he will work great with the Illinois commit as well as a reliable run game. Their defense has deteriorated a little I've heard. I'm excited to see how OE utilizes Kendall Kelly because he's an incredible athlete but never really got a chance to shine at SMN. Mitch Paden could make his name well known as well as Burrows at SMN as a result of Kelly's transfer. ^comment above^ SMW being so low is questionable. OE and SMNW being so high is also questionable. Experience is so valuable and SMW has a returning QB and RB. They always do well so I imagine that their line will be solid and they will do better than 6th. Switch SMW with OE and switch Leavenworth with SMNW for the same reason. OE and SMNW lost important parts of their varsity squad to graduation while on the contrary SMW and Leavenworth are returning starters. SME will thrive once again. Elliot Faeber will receive 100 catches, 1000 yards and 15 touchdowns considering no one in the league is capable of stopping him. double or triple teamed, a kid that is 6'5 has a 30 inch verticle and runs a 4.4 second 40 yard dash will only be stopped in college. 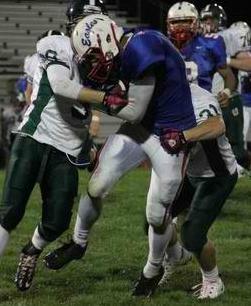 not in Johnson county football. SME lover give me a break. SME is only good in debate and swimming. If the field floods and they can do the butterfly and backstroke they have a chance. Otherwise forget it, never been a football school, never will be. Coach Shermann has done all he can with the program, he will leave in the next 2-3 years out of frustration. ON #1, surprise surprise. SMW is returning an average (at best) QB, a running back, and maybe a lineman. Sounds to me like they will be pretty young. I'm not sure they have one defensive player returning that played any significant minutes. It could be a down year for the Vikings. By the way....... Orange Mooney is a CANCER!!!!! I agree with anonymous on how OE uses Kelly. What I do know is that if Kendall don’t get the rock, he don’t block. If you think Orange Moody is a cancer then this kid is DEATH! He was a great athlete in the midget leagues but everyone’s caught up to him. Response to the Balless anonymous blogger on Orange Mooney being cancer. Remember this....cancer is almost impossible to beat!! Hmmm, Eli, going out on a limb there...ON, OE, SME, SMW top 4 teams. Just pick the four best coaches and put them at the top probably good strategy in predicting HS preseason football. ON clearly the team to beat, I think all the others have huge question marks. OE should be strong but no real big names coming back. 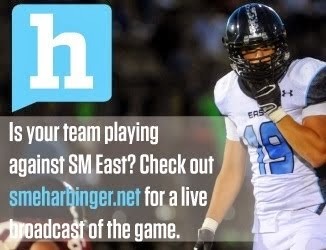 SME needs to find a QB or they will really struggle to score. Armani and Tre are certainly not medicore talents and SMW also returning the best kicker in the league and coach C will always put a quality D on the field. The real question for the Vikes is the offensive front, where they had no receivers who could hold on to Armani's passes last year and graduated most (all?) of the line. If last year was coach C's worst coaching job (and it was, taking a senior dominated team most thought would contend for state and turning them into a turnover riddled, penalty prone, ball dropping, foot shooting medicority) this will require his very best. West has benefitted from easy schedules many years recently, that is out the window this year with the most brutal schedule I've ever seen. Four of first five on the road including @LAW, @SMNW and @OE and oh yeah, their one home game in the first five is ON. Vikes could well be 1-4 out of the gate. I look for LAW, LFS and OS to be factors too. Anyway, all just guesswork this time of year, can't wait til week 1! I think OEs D is still pretty solid. They got marcus banks from the basketball team who can jump out the gym as cornerback now. Him Williams and Baltimore should be able to lead that defense. TheImpaler, West returns 1 offensive lineman. Olathe East also has D J Mccray , Sammy Mcreynoles and Chad Johnson back, Big time player that did not get to see much action last year due to playing behind player , like Fulson and other top player that OE had. The best thing about this year whom ever come out on top will have a good chance to win State . HATERS EVERYWHERE WE GO. LETS GO OEAAAAAST!! Just keep an eye on Armani Williams, in his first game of last year against ON, he came in a little before the half due to the starter's injury and owned the field. This kid has got good vision and is smart. Not to mention this kid's arm.